“Britten Sinfonia Academy hardly had time to get off the Barbican stage before they were back at work rehearsing for their next project – two mainstage concerts in Norwich and Cambridge as part of their parent orchestra’s At Lunch series. The course on Sunday saw the young musicians play (for the first time) not one but two brand new pieces. 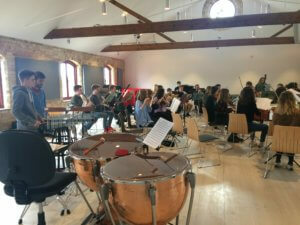 Despite an early start for many of the young musicians, they were in good spirits when they arrived at the scenic venue, Stapleford Granary, and they were ready for a full day rehearsing new repertoire. Elena Langer’s new work, Swimming in the Limmat was first on the agenda and after a quick Google, it was established that the Limmat is a river in Switzerland. Launching straight in and playing the piece through, it was immediately clear that the piece is absolutely beautiful, and very atmospheric. As a layman, I thought it already sounded fantastic. Led by Britten Sinfonia’s Alexandra Caldon, the BSA began rehearsing individual sections of the piece, tightening up a bit here, focusing on dynamics there, and (with the support of percussionist Owen Gunnell), working on a tricky rhythmic section. By the end of the morning it was already sounding much more professional. Next weekend Elena Langer will be attending the rehearsal and giving some pointers and feedback, and it’s clear that everyone in the Academy wants to make sure they are doing her work justice. You can be among the first to hear Elena Langer’s brand new commission. Tickets for At Lunch Four at Norwich’s St Andrew’s Hall and Cambridge’s West Road Concert Hall are on sale now.